Stamford Talk: Eat, Think, Drive, Blog! : Worst Parking Lot in the World? We all know how bad the Ridgeway Shopping Center parking lot is, but I want to thank my friend for taking a photo today that PROVES how bad it is. 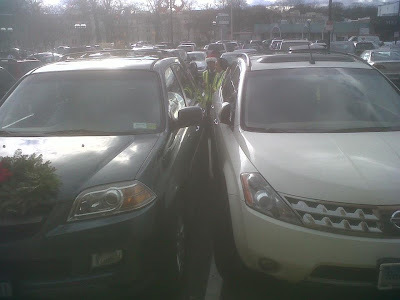 I suppose this parking lot incident could have been worse; it could have been an actual collision. However, I don't think it can get much more absurd than this. Can you imagine coming back to your car and seeing that someone has parked, no joke, less than two inches from your car? I have to assume the driver of the white car was intoxicated or otherwise out of it. My friend who took this photo said that the family in the blue car wasn't too fazed by the white car's comically horrendous parking job, and that they seemed to find the humor in it. It took 3 people to help the family back out. Streets of Stamford just blogged about how bad this parking lot is, and he pointed out a column in the Tuesday Advocate by Angela Carella about the lot, which includes many quotes from a Facebook page called "I Hate the Ridgeway Shopping Center Parking Lot." I really admire the man that created that page. Read more about it in the article, or go right to the Facebook page and like it! Ah yes, I love that parking lot. So many elderly drivers have been confused there. There was the incident where one driver used a car to pin the park bench to the storefront to the right of the Marshalls entrance... then there was Cafe Ooh La La's unfortunate ploughing by an old guy who should not have been behind the wheel of anything. Whenever I'm walking in front of any cars that are parked facing the sidewalk, I always just do a quick check to see if anyone is starting their car and seems, well, old. I know, it's horrible. But probably wise. The key at Ridgeway Shopping Center is avoiding the Summer St. entrance and lot. Either pull in the Sixth St. entrance and park under the ramp past Stp & Shop or go in from the Bedford St. entrance and pull directly into the parking garage. Always spaces here and you minimize driving through the madness.